I made this for last weeks Techno Challenge and used the Luminere and reinkers to make the snowman piece that I learned at the show I went to in the fall. The effects are less instense as I used regular reinkers instead of Copic marker refills but I do like it! I will share with you one of these days LOL! Just have to get time to sit and photograph the technique. 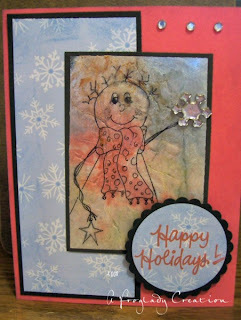 The stamp is from FireCracker Designs by Pamela and she is also sponsoring the prize for Stamp Something this week! Check it out!